On Sunday, it is all about the fourth versus fifth in Spain. Nuno's side will play host to Sevilla at the Mestalla and it can be labeled as one of the most exciting games in the La Liga this weekend. On January 26th, the towering stands of Valencia will witness a great match-up between the teams fighting for the Champions League spot. Both the teams are doing quite well in the Spanish league and both of them are unbeaten in their last six games. Valencia lost their last league match in November against FC Barcelona. Since the defeat at home against the Catalonian giants, Valencia haven't faltered. They also defeated the high flying Real Madrid side at the start of 2015. Valencia's win over Carlo Ancelotti's men marked the end of Real Madrid's 22 match winning streak. Los Che are currently fifth in the league with 38 points, only seven points behind the league leaders. With the top three likely to be Madrid, Barca and Atletico, Valencia can give a strong fight to Sevilla who are just a point ahead of them but with a game in hand. Valencia are seemingly back after a poor season. Sevilla are among the top four clubs in La Liga this season. Mathematically, Sevilla can be third in the league as they are yet to play Real Madrid. It is not written anywhere that the likes of Sevilla and Valencia cannot compete for the league title. Sevilla alike Valencia are on a six match unbeaten run (in the league) after falling against Luis Enrique's Barcelona. The Champions League hopefuls Malaga were the last team to lose against Sevillistas. But in the midweek Copa del Rey clash against Espanyol, Sevilla lost 3 - 1. Carlos Bacca's ninetieth minute goal was too little too late to stop Espanyol. Los Rojiblancos are coached by former Valencia manager Unai Emery, who likes to use set pieces. Sevilla have scored 30 goals and have conceded 17 in 18 games so far this season, which will be a great concern for the coach. 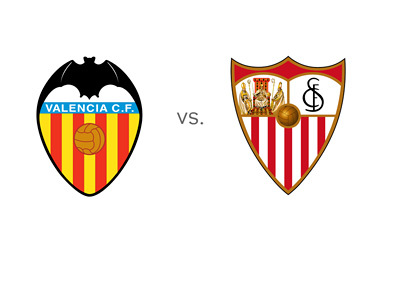 Valencia will miss Antonio Barragan and Pablo Piatti, two crucial players for the match at home, whereas Sevilla travel to the Mestalla without their star midfielder Stephane M'bia and defender Benoit Tremoulinas.